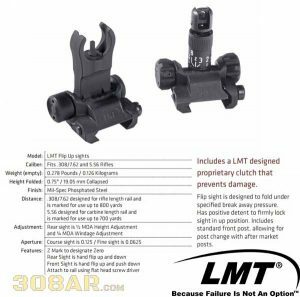 LEWIS MACHINE TOOL AR-10 308AR AR-10 BUIS Kit includes a LEWIS MACHINE TOOL Front Flip Up Sight L8K and LEWIS MACHINE TOOL Rear Flip Up Sight L8J 308AR BUIS Flip Up sight. Uses a press detent to open the clutch and allow easy closure. Clutch provides firm but flexible resistance to endure mild obstructions while staying upright and completely closes under high pressure without breaking. Designed for Rifle length rail and is marked for use up to 800 yards. Adjustment: Rear sight is 1/2 MOA Height Adjustment and 1/4 MOA Ambi Windage Adjustment. Aperture: Course sight is 0.125 / Fine sight is 0.0625. Features: Z Mark to designate Zero, Hand flip up and down, Attach to rail using flat head screw driver. GG&G Spring Actuated Flip Up Front Sight For Tactical Forearms has been redesigned to be lighter in weight and quicker in deployment. Although specifically designed to provide the correct sight height when mounted on a tactical forearm, the sight can also be installed on gas blocks that are the same height as the upper receiver. During the redesign process, GG&G developed a less expensive method to CNC machine the components which allows for a reduced MSPR while remaining built to quality standards here in the US. With just a push of a button, the front flip up sight can be quickly deployed on target. 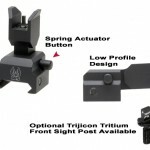 The sight not only springs into an on target position, but solidly locks into the deployed position, preventing accidental depression of the sight during a tactical situation. Another push of the button and the sight is free to be folded into the locked down position. The sight actuator button has been located on the left side of the sight, facilitating easy operation with the off hand, leaving your fire control hand in the proper tactical position—near the trigger. Not only is the sight set for use on the AR-15, but will co-witness when mounted to the tactical forearm of an AR-10. The sight stem has been designed to fold rearward. The dovetail interface can be easily installed with the included wrench. 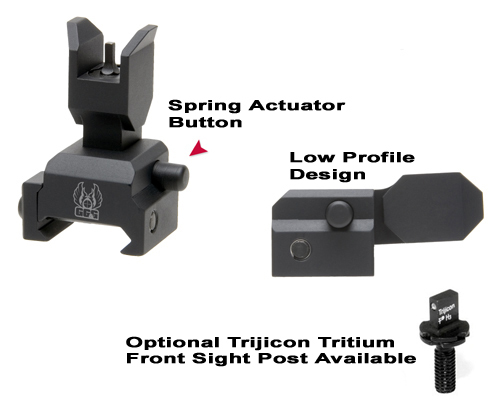 As an option, a Trijicon Tritium AR-15 Front Sight Post can be ordered with the sight for increased accuracy in low light operations. 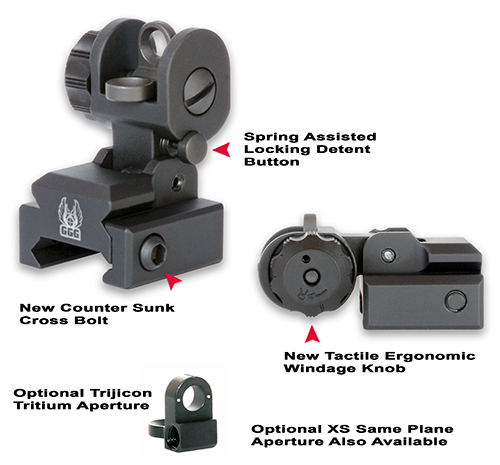 This tritium front sight option is the perfect addition for police and tactical users who may be moving in and out of darkness in real time. 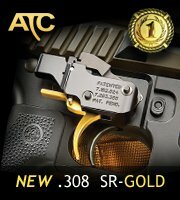 For more information on this and other GG&G products, visit www.gggaz.com. Improved and Redesigned for 2008, the GG&G A2 Back Up Iron Sight (BUIS) provides the operator with an easy-to-install and easy-to-operate flip up rear sight, and includes the all important locking detent. Improvements include a more tactile and ergonomic windage knob, a counter sunk crossbolt, and more streamlined body. The GG&G A2 BUIS is always at the tactical ready once placed in the up position. The sight cannot be folded down without depressing the spring assisted detent release button located on the left side of the sight base, eliminating the possibility of accidentally lowering the sight. This sight is used by elite armed forces and law enforcement teams worldwide. Weighs a bit more than 2 oz. Standard military A2-style double peep aperture, allowing for end user known point of impact. Full windage adjustment with improved knob. Made of aluminum alloy and hard coat anodized in non-reflective black mil-spec finish to provide combat durability. 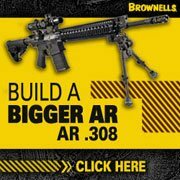 As the large frame .308 based AR rifles become more popular I am begriming to see more dedicated parts become available. This page is dedicated to one class of those parts, BUIS or BACK UP IRON SIGHTS. BUIS are quite simply front and rear sights, typically of a folding nature for rifles whose primary sighting method is optics. 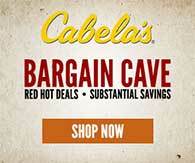 In the event of an optic failure the BUIS provide a reliable sighting option. Designed to work with Midwest Industries flip-up rear sights, all three models have standard A2 front sight post and clamp directly to Picatinny rails. 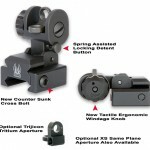 MCTAR-FFR mounts on AR-15/M16 handguard rail; MCTAR-FFG attaches to gas block rail. MCTAR-10-AFFG mounts on gas block rail and positions sight post at correct height for ArmaLite AR-10® carbine with factory-installed gas block and 16″ barrel. May fit other AR-style .308 rifles with gunsmith modification. SPECS: Aluminum, hardcoat anodized, matte black. 1-1⁄8″ (2.9cm) long, 1-7⁄32″ (3.1cm) wide, 7⁄8″ (2.2cm) high folded. Approximately 1.7 oz. (50g) weight. MCTAR-FFR – 1-7⁄8″ (4.8cm) high extended. MCTAR-FFG – 2-1⁄8″ (5.4cm) high extended. MCTAR-10-AFFG – 2-3⁄8″ (6cm) high extended.